Fifteen years in the house cleaning business and I can honestly say Penguin’s Best rarely needed to use more than five cleaners in any one home. Walk away from the belief that the more cleaners you own the cleaner your home is. How is it working for you? Think less. Think multipurpose. Think Green. Do your homework when it comes to chemicals, and remember to Keep It Simple (KISS) always. Who comes in contact with CHEMICALS every day? EVERYBODY! 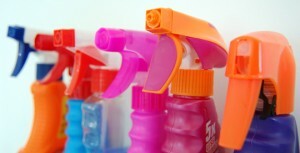 Exposure to household cleaners can be more harmful to your health than hazardous chemicals. People take notice to the latter; however, often we disregard the cautions when it comes to cleaning products. From the 5 cleaners, the first 3 are universally known and are MUST HAVES in every home. GLASS CLEANER: Multiple surfaces including mirrors and glass. A safe option for use on appliances and stainless steel. *A footnote: In Haley’s Cleaning Hints you will find hundreds of green clean recipes for your home made from ordinary household items. A good read! BLEACH: The ultimate kryptonite for germs—Lethal! Mix one part bleach to 10 part water solution (never use bleach straight). Always work in a well-ventilated space—especially when you use bleach in smaller rooms (like a bathroom). *A footnote: After 24 hours, your water/bleach solution will lose its potency. Get in the habit of mixing a small batch whenever you need it. POWDERED CLEANER: Ajax and Comet are common options, but you may also find similar cleaners in a cream form. Powdered cleaners are often used for the inside of porcelain, stainless steel, fiberglass in kitchen and bathroom sinks, bathtubs, and toilet bowls. Only a small amount of product is required for a good clean. The cream varieties allow you to have better control when dispensing, thus leading to less product waste; however, I personally prefer the powder form. To limit the powder flow, open only two of the many holes at the top of the container. Also consider powdering only the sponge or brush you are cleaning with rather than the surface. Add just a small amount of water while you are agitating the area to be cleaned. Thoroughly rinse the surface with cold water when done. Important Note: never leave a powder product on a surface and walk away without rinsing. The paste will harden, and will be tough to rinse. SURFACE CLEANER: I have had more debates on the topic of surface cleaners than on any other cleaner. Especially now with the popularity of greener living, chemical companies are slapping more Green labels on their cleaning products than their food industry counterparts, like Smart Choice. DO YOUR HOMEWORK. Choose a surface cleaner that is non-toxic, biodegradable, odor-free, and safe to use around food. Also, choose one that can be used on multiple surfaces. At Penguin’s Best we’ve used Red Juice for the past 15 years with great results (thecleanteam.com). * TIP BOARD: When you invest in big ticket items for your home—such as kitchen or bathroom counters, floors, furniture, rugs—take the time to speak with your retailer regarding proper maintenance of your purchase. It’s ALWAYS a good idea to get this information to reduce waste and save money. If the retailer or manufacturer recommends a specific product, ask him or her if they can provide you with more details. Investigate the chemicals you are currently using at home and anything new that comes in the door—including all aerosol products (hairsprays to room fresheners). CLEAN OFTEN: If you clean your home more often, and do spot cleaning when time is tight, your dependency on harsh chemicals will greatly be reduced. CHOOSE YOUR TOOLS WISELY: Use the right tools for the job (coming soon in Part 2 of Tools of The Trade). SIMPLIFY: Get in the habit of using ordinary household items like distilled white vinegar. READ LABELS: ALL of them. Contact the manufacturer and request the product’s Material Safety Data Sheet (MSDS). This document outlines the health hazards of a product and how to protect yourself from any danger associated with the product’s chemicals. CONCENTRATE: Buy concentrates that you plan to use within one year. All cleaning products lose their effectiveness over time. SAY NO TO HOT WATER: Do NOT use hot water with ANY cleaner. The heat activates the chemicals, and the steam will prevent you from seeing the job at hand. Nicky P.E. Tomboulides, MBA has run and managed Penguin’s Best Housekeeping Service, LLC since 1994. Nicky’s entrepreneurial spirit is behind the success of her business. Penguin’s Best, an upscale residential cleaning service, has evolved from teaching and training its own crew to running outside classes and workshops for various organizations, agencies and schools. All website content, Copyright © 2019, Penguin’s Best Housekeeping Service, LLC. All rights reserved.